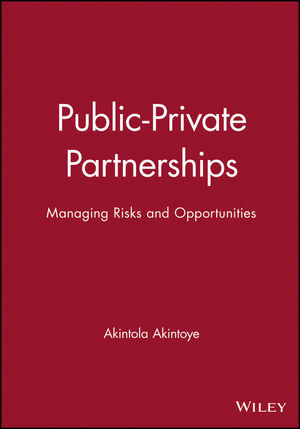 This edited book will familiarise both researchers and construction professionals working with public private partnerships (PPP) with the issues involved in the planning, implementation and day-to-day management of public private projects. It will show how current risk management methods can help the complex process of managing procurement via such partnerships. The chapters - most authored by a practitioner/academic partnership - are organised round the concepts of best value and use the findings of a major research project investigating Risk Assessment and Management in Private Finance Initiative Projects. The analysis of this research will be supplemented with contributions by leading international experts from Hong Kong, Australia and Singapore, covering hospitals, schools, waste management and housing - to exemplify best practice in PPP-based procurement. Akintola Akintoye, Professor of Construction Economics and Management, Dean of School of Built and Natural Environment, University of Central Lancashire, UK; Joint Editor of Journal of Financial Management of Property and Construction, Joint Coordinator of CIB TG72: Public Private Partnerships.